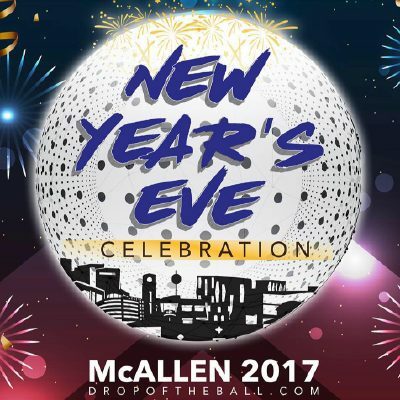 McALLEN — The New Year’s Eve ball drop event has been canceled, according to the city of McAllen and the promoters organizing the festivities. Organizer Yair Cruz said the cancellation was due to weather conditions. Cruz, however, said in a phone interview Thursday that the event will instead be postponed. McAllen Assistant City Manager Michelle Leftwich said via email Thursday that Cruz had yet to obtain to permits for the ball drop. In a subsequent news release, city officials announced that the promoter canceled the ball drop. The Facebook page for the event cited “unfortunate circumstances” that led to the ball drop being canceled. Another cause for the ball drop’s cancellation, according to Cruz, stems from safety concerns. In a statement, he said that organizers are moving forward with plans, in accordance with the city, to hopefully host the ball drop for the following year, if the climate will allow for it. Bruno Mars and Beyoncé tribute artists, who are arriving from out of town, along with other musical guests will still be performing at Marroko Live Dance and Nightclub, located off of Austin Avenue downtown McAllen. The venue has yet to be confirmed, but according to Cruz, performances at Marroko will take place from 8 p.m. to 2 a.m.
As for the advertised VIP access, tickets will “hopefully” be distributed, according to Cruz, and are still being sold, at several locations, including Marokko Live and Holiday Inn Express. A statement released by the city of McAllen said, “individuals looking for a location to celebrate the end of 2017 should make plans to enjoy the night life found along 17th Street,” and included a precaution to avoid drinking and driving. This year, for the eve of 2018, a time-honored tradition is returning to McAllen. The ceremonial dropping of the New Year’s ball is back by popular demand, and returning with it is a show billed as a “family-friendly” event that will be free to the public. Featuring live performances, food booths, vendors and rides, the New Year’s Eve festivities will run from 5 p.m. to 2 a.m., as many banda, norteño, country and reggaeton groups will take the stage. Fifty booths are expected and will be selling food items and merchandise. The ball drop will take place on 17th St. in downtown McAllen. Two stages will provide continuous entertainment off Austin and Eerie avenues. Closer to the midnight drop-off of the 18-foot, LED-lighted ball, Beyoncé and Bruno Mars tribute performers will hit the stage. Local dance studios have provided backup dancers for these performers. Saldaña says the ball was newly constructed for this year and will shine brighter than those of years past. Villa del Sol construction and Applebee’s are two major sponsors, with the latter contributing beer gardens. Thousands are expected to make it out, according to Saldaña, who has received calls and messages “day and night” from residents of Pharr, Weslaco, Brownsville, McAllen and all throughout the Valley. A special firework display will be happening once the clock strikes midnight. VIP tickets are being sold, beginning at $40.